One of the great things about this industry is that you KNOW OF everyone. It is a pretty small fish bowl. But you don’t actually know them. You could pass them on the street and not even notice. I am honored to be included in a book blog hop with some new friends and some old friends all from the same fish bowl. What is the girl scout song? This version is a bit different from from I grew up singing but it still has the same message. 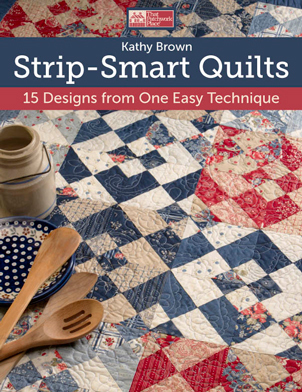 Strip Smart Quilts published by That Patchwork Place. Friday, June 10 – Pam Vieirra McGinnis – PamKitty Morning! Thursday, June 16- Lissa Alexander – ModaLissa– That’s Me! I love Kathy's quilts and her technique for making them. Wonderful book! it is amazing what can be done with just 2.5" strips of fabric! Looking forward to this book and must have ruler.